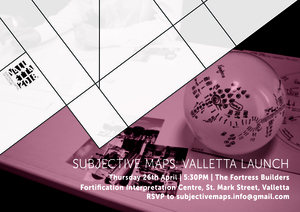 The launch for the printed Subjective Map of Valletta will take place on Thursday 26th April at 5.30pm at the Fortress Builders, Interpretation Centre, St. Mark Street, Valletta – https://goo.gl/maps/1paKRonWW772. This project, supported by Valletta 2018, is about people designing their own map of the town they live and work in. The project has been ongoing since October 2016 and workshops and interviews with different users of the towns were conducted, to draw maps, tell stories and meet each other. These Subjective Maps were collected from six different localities in Malta and Gozo, including Valletta, St Paul’s Bay, Ħamrun, Birżebbuġa, Gżira and Victoria (Gozo). The project has since then produced these maps so that they can be used by others to visit and navigate the town. This is the 6th and final launch event and will showcase the subjective map of Valletta and a model produced by artist, Madeleine Fenwick. Some light refreshments will be served and the event will last for about an hour.